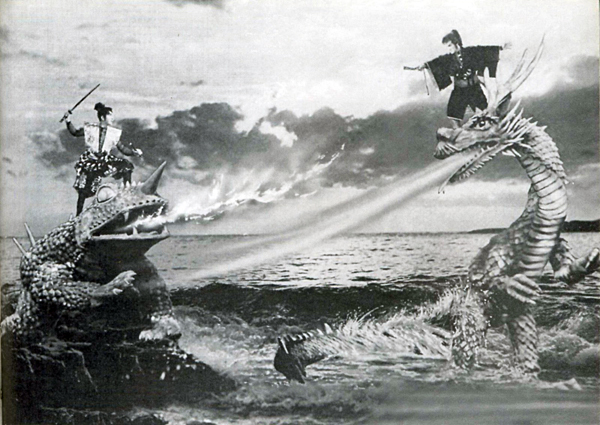 The main-event of Kairyu Daikessen is an extended kaiju beatdown between dragon and toad, with a castle destroyed in the process. This longshot actually begins a DIALOG scene between the monsters! They cut old-school rasslin' promos on each other, then proceed to have fun storming the castle. In Japan, dragons don't breathe fire, toads do. But the dragon is a big hoser himself, so it's a pretty even fight. 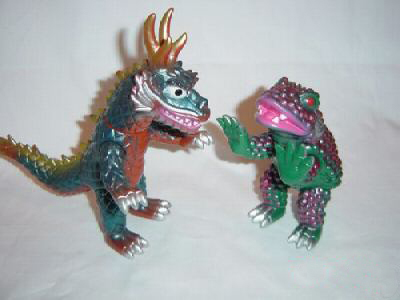 It's toad warrior vs. reindeer rex is the original MMA (Mixed Monster Attack). This giant spider (species: Arachnus Deus Ex Machinatus) flies in at the last moment to save the day. And in the fashion of all good movies, it ends with an explosion. Kairyu Daikessen is actually more available now than it ever was back in the day. 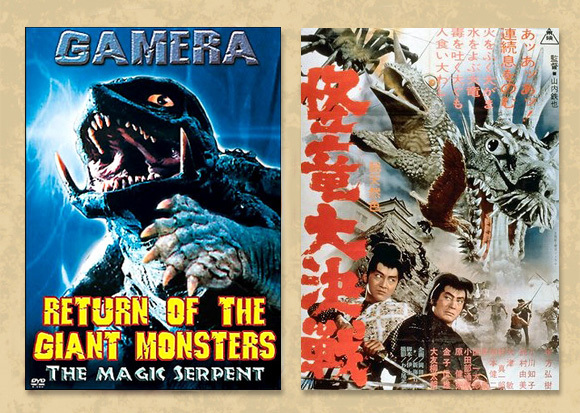 Beautiful widescreen subtitled editions are floating the trader seas under titles like “Dragon Showdown.” The only legit US release is burried on a double feature disc with a Gamera flick, and it’s the pan and scan AIP dub. The American version has it’s charm though, as all the monster “voices” were replaced by ones more familiar to US audiences (Godzilla, Rodan, Ebirah included). Japanese publicity departments were superb at crafting these staged press photos that would summarize the movie in a scene that never actually happens. Best use of this practice ever is in the press stuff for WAR OF THE GARGANTUAS. Google it. I'd possibly be willing to trade a kidney (not necessarily mine) for this set of 7" vinyl dolls from, I believe, Marusan or Marmitt.